It’s never been easier to make low carb sandwich bread. This version uses all real food ingredients and comes together in your blender! I feel like a total scrooge admitting this but I’m kind of glad the holidays are over. 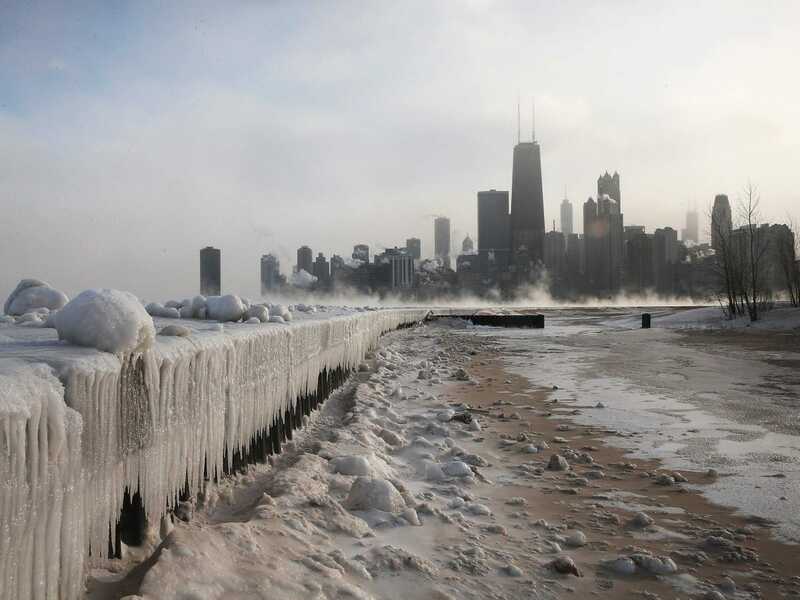 Not about going back to work, or waking up early, or the promise (threat, really) of 3-5 more months of weather ranging from uncomfortably chilly to I’m-so-cold-I-might-shatter-if-touched. No, certainly not that. Cold weather feels colder to me when I’m not surrounded by twinkly Christmas lights; this is a universal experience, right? It’s not that I am opposed to holiday cheer or twinkly, cold-weather-justifying lights decorating the neighborhood, but the whole cheese/cookie holiday diet was really starting to get to me. And my body can’t take it anymore! I’m not doing a Whole30, per se, but most of the “Nora Reset” diet falls into that camp, including, technically, this low carb sandwich bread – though I know that this is blasphemy because Whole30 forbids any copycat recipes made of legal ingredients but in the form of a forbidden food. Since I’m doing the “food that makes me feel good” diet, this bread is totally LEGAL. 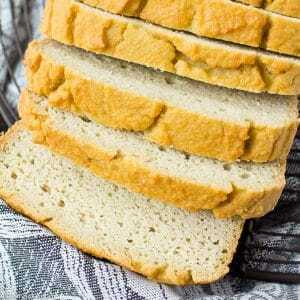 I tinkered with the paleo sandwich bread that you have seen before to remove the tapioca starch (a seemingly easy task, until you actually try it. 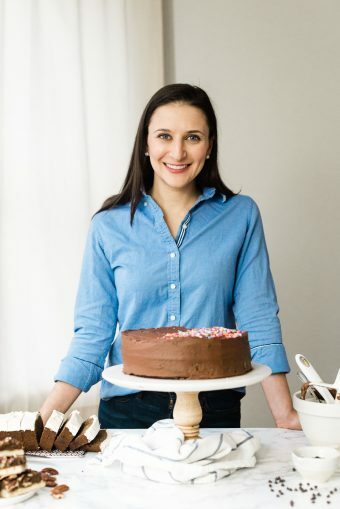 The first few loaves tasted like bland, gummy cakes) and the baking powder (which can contain cornstarch, causing a reaction in some people), leaving only the low(er) carb ingredients that are less likely* to trigger a reaction. It couldn’t be easier to make! 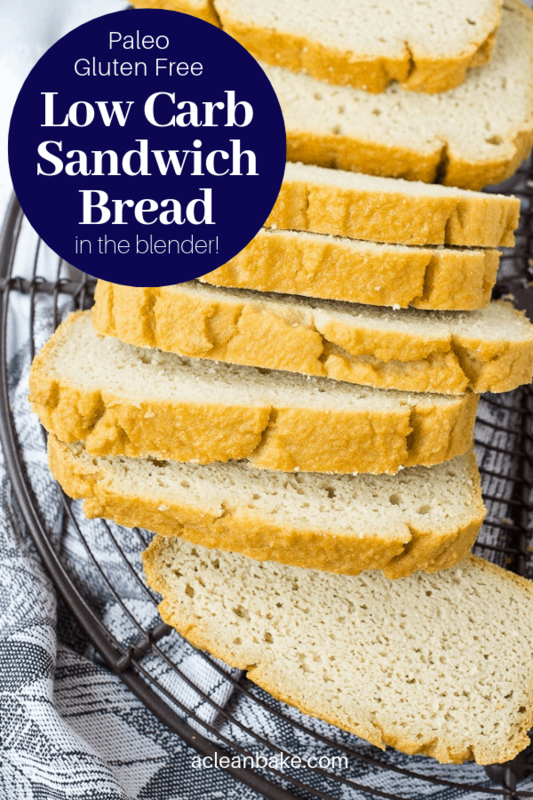 Unlike the original sandwich bread, you can make this low carb sandwich bread in about one minute: if you have a high speed blender, you can use it to prepare the batter – but be careful not to tax the motor. Dump the dry in and mix quickly and at high speed. The batter gets very thick very quickly, so if you hear or smell your blender’s motor struggling, just pour the batter into a bowl and stir until the batter is smooth. I haven’t tried making this bread ahead and freezing it yet, but I imagine that, like it’s slightly plusher, carbier counterpart, it freezes well, once completely cooled, sliced and wrapped tightly. *Unless you are allergic to tree nuts or coconut, in which case, stay away. Now, go enjoy a sandwich! Preheat the oven to 350F. Grease an 8.5" loaf pan and set aside. In a large mixing bowl, whisk together the almond flour, coconut flour, and salt and set aside. Blend the egg yolks, oil, water, vinegar, and baking soda in a high speed blender on medium speed for 5 seconds until combined. Turn off the blender and allow the mixture to sit for 1 minute. Add the egg whites, and mix for 10-15 seconds until the mixture is frothy. Add the dry ingredients all at once and immediately process on high for 5-10 seconds until the batter is smooth. Pour the batter into the prepared loaf pan and smooth the top into an even layer. Allow the bread to cool for 10 minutes in the pan before turning out onto a wire rack to cool completely. A note about mixing with the blender: You have to work very quickly before the dry ingredients absorb the wet and the batter becomes too thick for your blender to handle. If you hear or smell the motor straining, pour the batter back into the bowl that the dry ingredients and use a hand mixer to finish making the batter. If you have trouble releasing the bread from the pan, run a thin knife around the edges before you turn it over. Store fully cooled slices (or the whole loaf) in an airtight container in the fridge for up to a week or in the freezer for up to three months. The Mr. and I both live away from our family so the holidays were fairly low key for us & we managed to maintain a healthy diet with no cheese and minimal cookies. As a matter of fact, during the holidays, the Mr.upped the number of times he went to this brutal bootcamp exercise class …which resulted in him losing weight during the holidays (unheard of, isn’t it?) . Anywhoo. … All the exercise has him banning carbs and eating more protein than usual so I have been on the lookout for new low carb recipes. 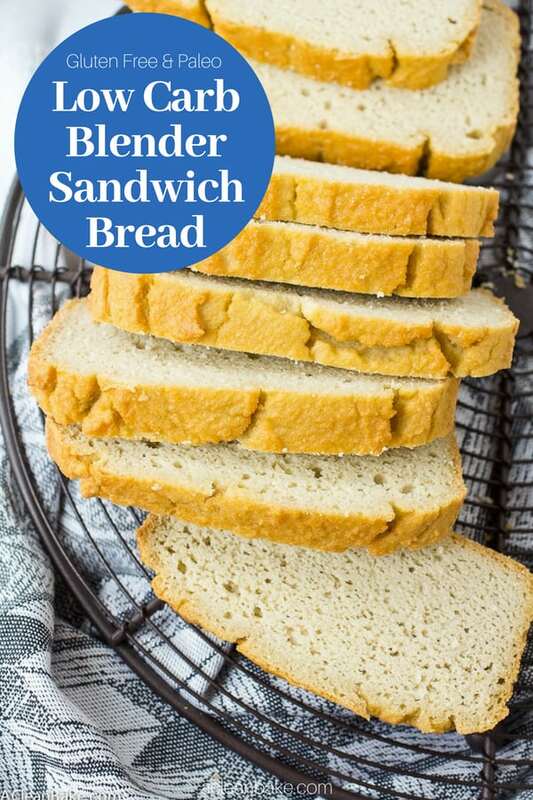 This bread would be perfect for whipping up a protein loaded sammy. . .paired with salads etc. This is perfect for your husband’s new eating plan! This bread looks incredible! Love the thick and deliciously chewy look of this bread! I just started the low carb train and Im super glad I found this recipe because I kind of miss my bread! Then this is totally perfect for you! 6.4g, assuming you slice the loaf into 12 pieces. Is the nutrition label below the recipe not showing up for you? Mark, if you read pre ious comments you dill have your answer! Thanks Lauren! It did take a few tries, but it was well worth it!! Happy new year! this is really good and comes together so quickly! i gave it to a friend of mine who has just gone gluten-free. I just quickly plugged it into My Fitness Pal and it looks like the recipe (in total) has 2,328 calories, 69 g carbs, 204 g fat, and 86g protein. This is all based on MFP ratings, so consider it a ballpark. So, if you slice it into 12 servings, that would be about 194 cal, 6 g carbs, 17 g fat and a little more than 7 g protein per slice. Hope that helps! Would those be net carbs? No, the nutrition info contains the straight carb count (not net). According to the carb counts on my ingredients, it would be 28 net carbs. So about 2 net carbs per slice, if sliced into 12 servings. Looks like this bread came out perfectly and so gorgeously! Keep warm in the chilly weather! Thanks, Monica! I hope you’re staying warm too! This bread looks amazing and easy. Dose it taste of coconut flour? My partner is not a fan of that taste. Hm, I think it depends on how sensitive you are to the flavor. Some people say they can’t taste it in the slightest, while others notice it, but I’ve never heard that it is strong enough to be off-putting, even to coconut haters. I’m sorry I don’t have a more clear answer, but I think it depends on your partner’s taste buds! I hope you get to try it though! Hi – I was wondering what type of oil you used? Hi Kelly! I tested this with organic canola oil and olive oil. I hope that helps! Has anyone tried making it in a bread maker? Not that I’m aware of, but I’m not sure the bread maker would work enough air into the batter, or get the clumps out the way mixing or blending does. If you do try it, please let me know how it turns out! 1. Have you tried toasting this bread? How does it toast? The paleo bread I bought doesn’t toast well, so I imagine it’s a challenge with these ingredients. 2. I know this is a grain-free recipe, but curious if you have you ever tried replacing the coconut flour with buckwheat or millet flour? I’m hoping for a very savory bread. 3. Can the vinegar be substituted? Would lemon juice work? 1) This bread toasts a little, but don’t expect it to toast up like regular bread because there is no starch for the toaster to dry out. If you can tolerate a little bit of starch, the grain free sandwich bread recipe I also have on the site toasts up a little bit better. Either way, though, the higher fat content of the flours (vs wheat or another grain flour) does prevent it from fully hardening up so you’ll never get a perfectly crisp piece of toast with these. 2) I would not recommend trying to replace the coconut flour with anything else. Coconut flour is a really unique flour that absorbs moisture differently than any other flour, so I really can’t predict how it would turn out if you replace it. 3) Vinegar can definitely be replaced with lemon juice, but you can also use unfiltered organic apple cider vinegar which I believe is allowed on the candida diet (but of course please check with your doctor or nutritionist first). I am just starting to eat gluten-free and am so glad I found this recipe! I was wondering if you think it would be okay for me to use all coconut flour instead of using some almond flour. Hi Anna! I’m so glad you found this site! Changing your diet can be tough but I hope I can make it a little easier for you. With this bread recipe, unfortunately, it has to be made as written. The difference between coconut flour and almond flour is that coconut flour is very high fiber and very dry so absorbs moisture like a super sponge! Almond flour is fattier so the healthy fats help to give the bread moisture. Together, they balance. In order to use all coconut flour, you’d have to increase the liquid/moisture in the recipe substantially and I’m afraid I don’t know how much and of what to increase! So, it’s best to stick with the recipe as written. This looks like a delicious recipe. I don’t want to change it for change’s sake but do I it would work to replace up to three eggs with chia or flax eggs? I’m trying to reduce the number of eggs that I eat. I know: how about I have a go and get back to you. Thanks! Hi Virginia! That’s a tricky one – I tried this recipe many, many ways and can tell you without hesitation that the eggs are a vital part of the recipe. I wish I had a better answer for you but I’d recommend not replacing the eggs at all. Sorry! I just made this and is delish. I did have trouble releasing…will grease the pan better next time! I’m so glad you liked it! Yes, it can be tricky to release, so an extra-generous coating of grease on the pan is never a bad idea 😉 Other than that, I’m thrilled that it was a success! Putting parchment paper in the bottom of the pan will help, too, Linda. Have you tried Almond meal instead of the flour? Yep! And making the switch should be no problem. In some cases, what I’d call almond flour (blanched/no almond skin and very finely ground, almost to a powder) is packaged and labeled as almond meal anyway. In some cases, what I’d call almond meal (not blanched, so skins included and not as finely ground) is labeled almond flour. So, it mostly depends on the brand. Both types of almond meal/flour will work, but if you use the kind that includes skins and is not so finely ground you may find that your bread is a little crumblier. It will still work though. Good luck! I can’t eat almond flour, would I be able to sub rice flour perhaps? No, I’m sorry, but there is no sub for the almond flour since it works so differently from grain flours like rice flour. To be honest, I wouldn’t start playing around too much with other flours, especially not homemade, because you run the risk of the grind not being fine enough to get the right crumb (commercial nut flour is typically ground much finer than you can achieve at home, unless you have a mill) and getting a gritty bread. Plus, different nuts and seeds have different fat (moisture) content so your bread might come out too dry or too gooey! Best to stick with the recipe as written in this case – sorry! Is there a difference between blanched almond flour and not blanched? I used almond flour that wasn’t blanched and it just looks different but I’m wondering if it makes a difference in taste? 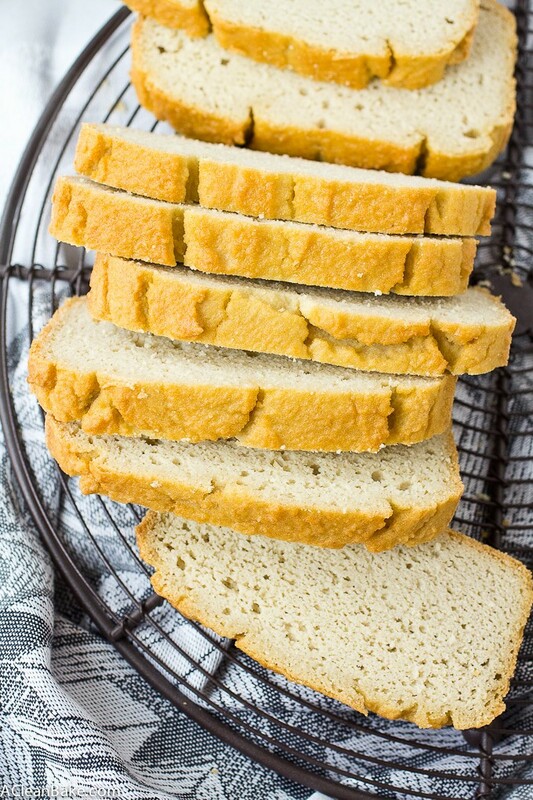 3) (sometimes) a slightly crumblier finished product – for example, this bread made with non-blanched almond flour might crumble slightly when you cut it but should still ultimately taste great! Does this bread have an eggy taste? Maybe, if you’re extremely sensitive, you might taste a little egg. But in general, no, you should be good! Hi! Just found this recipe to add to my “intend to try” list. Would this recipe work with baking them into like a burger bun shape? Hi! I’m so glad you found me! That’s a great idea, but you’d need something to hold the batter into that shape (this makes more of a batter than a dough), like a large muffin pan. Let me know how it goes! Just made this. it is not cool yet, but I cut a slice anyway. It is awesome with a bit of butter! I am not big on sandwiches anyway, but this will be great with a bowl of soup or some ham and beans. Thanks! Oh it is wonderful warm too! The best thing about a good loaf of bread is that it goes with anything. This recipe may be called “sandwich bread” but it would be equally great with any of you other favorite dishes! Any chance you have a video of your process of mixing this together? And are you referring to a stand-up mixer like a Kitchen-Aid? Hi Nora. I made this but it didn’t rise that well, my loaf is only about 2 inches tall. I followed everything in the recipe. Do you know why it could have done that? 1) Do you have an oven thermometer to make sure your oven was at the right temperature? 2) Did you replace or eliminate any of the ingredients? 3) How old are your baking soda and your vinegar? I am currently munching on a piece of this yummy bread. It’s still warm from the oven and I spread peanut butter on it. It cooked perfectly at 60 min. I am pretty sure I can get 16 slices out of the loaf which brings the NET Carbs per slice to 3. For sandwiches, I may try to slice it even thinner. I don’t have a blender so I was a little leery of making it with a hand mixer, but it worked perfectly. I sprayed my loaf pan with non-stick spray and it dumped right out when done. I will surely be making this again and again! Have you tried adding savory spices, e.g., rosemary, thyme, garlic? Oh that is great to know!! Thanks for letting me know! I usually go with a generous slice, but if it works for you to get more, thinner slices out of the loaf, that definitely helps and makes the loaf last that much longer! I haven’t tried adding spices yet, but it is on my list! Did you add any? This is the second time I made this bread. I sliced the whole loaf after it cooled and kept it in the freezer, pulling out a couple of slices to toast. Because I ate it almost exclusively for breakfast, I changed the recipe just a little this time I substituted 1/4 of Cary’s Sugar Free Maple Syrup for 1/4 cup of the water and added 2 tsps of cinnamon. Now it has just a hint of sweetness and goes even better with peanut butter! For the next batch I will try it on the savory side. Will let you know how that turns out. Ohhhh I have all the ingredients so must try this! I’m thinking of french toast..Mmmm! It works great for French Toast!! Enjoy! Just pulled this out of the oven, let it rest, and had a piece… delicious! I made it as is and it’s great! Probably not, unless you have a small bread machine that makes an 8.5″ loaf (in my experience, most US bread machines make enormous loaves). If you do have a smaller machine, I’d still advise mixing the batter in the blender or by hand, since I doubt the machine will get all of the clumps out. 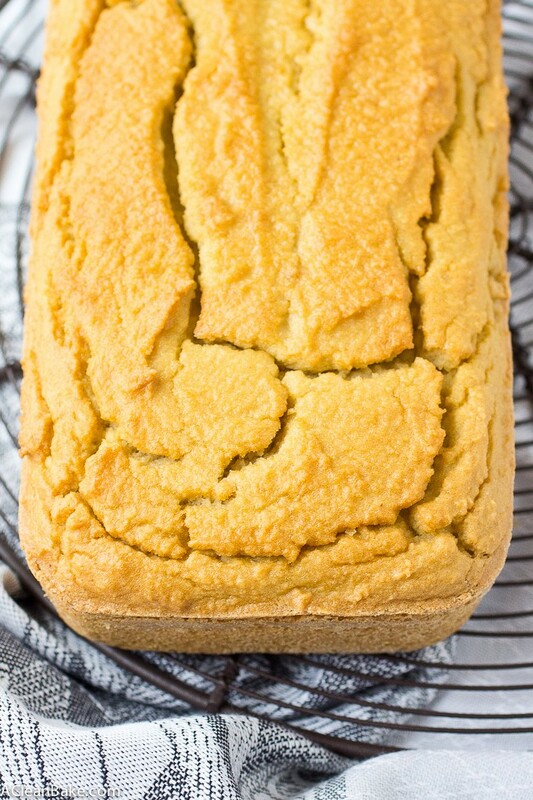 I wanted to know if it is possible to make this bread without the coconut flour. I Ann on the SCD diet and I really miss being able to have sandwiches. Also I am extremely allergic to coconut. Which has made it impossible to make bread. If the coconut can’t be replaced do you have a bread recipe that does jot involve it? Thanks. Hi Katelyn! Unfortunately, right now it is not possible. Coconut flour acts in a really unique way to absorb moisture and hold the loaf together and there is no easy substitute (that I am aware of) that works quite the same way. I’m so sorry! PS: Right now I don’t have a coconut-free bread recipe, but I will definitely keep that in mind and see if I can figure something out! Have you ever used this recipe to make burger/sandwich buns? I haven’t but I think as long as you had one of those bun molds or a mini cake pan (something like this: http://amzn.to/2e9N2L4) it should work great! Hi Cheryl, there are 3.7g of dietary fiber per slice. Thanks for your work on this recipe. I hate to be the buzz-kill, but I absolutely could not eat this. There is something about it that I must be sensitive to, as I could not choke down two bites without a violent gag reflex. It looks like bread, but that is where the similarity ends. Now my wife, who is not doing the low-carb thing, tried it and says it’s fine. To me though, it has a smell that I can’t quite describe; musty maybe, that I couldn’t get out of my head all day, and made me nauseous every time I thought about it. I’m just wondering if it might be the vinegar. I know there’s not much in there but a little cider vinegar goes a long way. What is the purpose of the vinegar, and does it have to be in there? I’m not trying to be a troll; I really want to find a low-carb alternative to bread, but maybe that’s like wishing for a low-carb Snickers. Hi Steve – first of all, thanks for your candor! I always want to know what people think of my recipes, even when it is not the best review 🙂 I think your taste buds may be reacting to one of two things. First, perhaps it is the eggs. There are a lot of them in this recipe and you may not expect to taste such an eggy flavor in bread. Second, as you suggest, the vinegar (although if you think the smell is musty, my money is on the eggs). Unfortunately, I would not recommend removing or adjusting either of these ingredients. 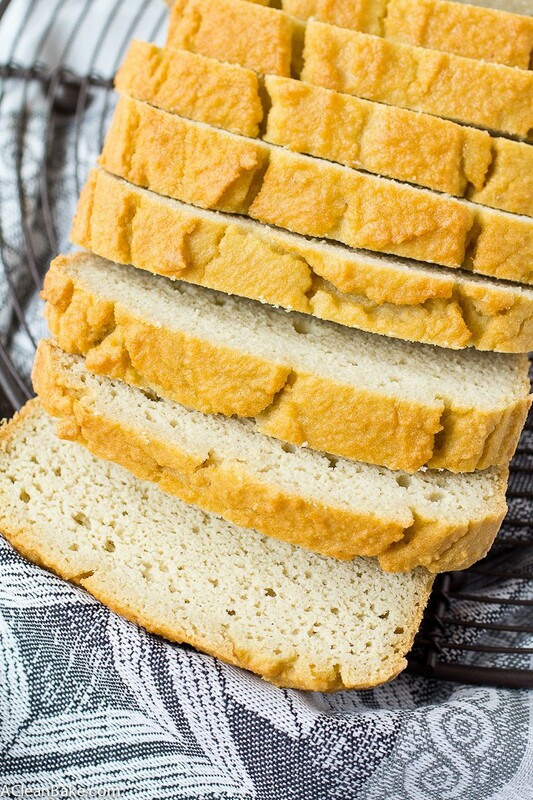 The eggs provide necessary structure (in the absence of gluten or additives like xanthan gum that you’ll find in most gluten free breads), while the vinegar provides the acid necessary to react with the baking soda and produce the lift that makes the bread, well, bread, rather than a heavy brick! I have another recipe on the site for sandwich bread (https://acleanbake.com/grain-free-sandwich-bread-yeast-free/), which is also pretty low carb and you might consider trying, though it contains quite a few eggs and some vinegar as well. However, it may be a case of low carb Snickers bars (I love that analogy :)), where you can never perfectly mimic the mixture of gluten, yeast and water without, well, gluten or yeast! Can I use baking powder instead of baking soda? I baked with both of them when using almond flour and my bread didn’t smell of ammonia when I used baking powder. Yes, you can use baking powder. You may get a little more lift (rise) in the bread as well. If you use baking powder, you can omit the vinegar. However, I’m not sure why baking soda would make the bread smell like ammonia. Ammonia! As terrible as it sounds, this is the smell I can smell coming from the bread as well! I may sub in the Baking Powder next round to see if it comes out smelling the same! It holds together super well but it’s hard to get past that smell. Weird. Hi Brandy, that’s strange! I’m so sorry the bread turned out oddly for you. If you switch to baking powder, eliminate the vinegar from the recipe as well as the baking soda. Also, make sure you are using good quality, fresh eggs. Old or poor quality eggs could also be accounting for the unpleasant smell. Will you let me know how it goes? I want to make sure you can enjoy this bread! Is this fluffy like regular sandwich bread? Or it heavy? Hi Diana, it’s a little denser than higher-carb (wheat or other grain-based) bread would be, but it’s still soft enough to enjoy as a sandwich! This was very dense when we made it, and at roughly 200 calories a slice, you’re looking at 400 just for the bread before you even put anything on it! Low carb it is (although when I calculated up the ingredients, it was a little higher than the nutrition info above). Tastes fine. But I think you really have to want bread, and have lots of calories available, and then also *like* dense bread, for this to be a viable option. Oh, and the slices are about about half the height of your typical store bought loaf..so you’re making tiny, elf-like sandwiches. The picture doesn’t really give you a sense of scale. Sorry, but this recipe gets a pass in our house. I’m stuck with a big (small) loaf of admittedly decent tasting, but costly bread I can’t convince the person who wants bread to actually eat. I suppose I should be thankful I have kids to pawn it off on. Again, as was recently posted above, not here to be a troll, just sharing an honest opinion. I suspect if this recipe could be modified to bring “fluff” and air into it, it’d be more accessible (still, the calories are an issue). And as a comparison, our local grocer carries their generic light-wheat bread which is 80 calories for 2 slices (vs. 400) and 13 net carbs (vs. the roughly 5-8 this will carry depending on your particular ingredients). I never have a problem staying under my carb limit. Calories..that’s another story. Until I find something that beats my grocer’s surprisingly good house brand light wheat, I’ll keep searching. Thanks for putting this out there – not every recipe can be a winner for everyone who makes it! By all means, if you can and want to eat your grocer’s wheat bread – feel free! You’re absolutely right that this will not taste like store bought wheat bread. It’s not intended to. Most people here eat grain free, so store bought bread is not an option. Sorry this one wasn’t for you. I have a question. Could I mix this all up with a mixer instead of a blender? Yep! Just be careful to get all of the clumps from the flours out. Had a go at this and unfortunately it came out as a somewhat dry, solid, inedible lump ! It smelt great during the cooking ! I’m not sure if the translation from cups to UK measures got a bit messed up. What should the conistency be when you put it in the baking tin ? like a batter or stiffer ? Hi Nick, I’m sorry to hear that! Something must have happened in the conversion. Did you measure the dry ingredients properly (spoon them into the measuring container, rather than scoop, which packs the flours down and usually ends up with too much)? That would be my guess. The batter should be a runny consistency, not a dough like normal wheat bread. It will be like a slightly thick pancake batter when you put it into the pan to bake. I hope that helps! This is hands down the best low card bread I’ve had. I’ve made Keto bread and many other paleo breads and either they have too much dairy/cream cheese (Keto) or they were too dry or super eggie and dense. The ingredients are not super expensive either and will allow me to make it more often. It also wasn’t a complicated recipe. I really appreciate it being a time saver. With a lot of paleo recipes, I feel like they require that I grow it, mill it, grind it, ferment it, read it a bedtime story…like I don’t have to work and tend to my family as well. I’m eating a sandwich right now and it’s wonderful. I did sub butter for oil and it’s still very good. Thanks so much. I am a huge carb addict and this makes it a lot easier for me to stick to my low carb diet. Question: If I double the batch to make it taller/higher will it change the outcome or do you have suggestions if I plan to double the batch? If not, no worries. Thanks again! Appreciate this loads. Hi! So I have just pulled out all of the ingredients and figured out the carbs and fiber. According to my calculations, if you cut this in 12 slices it’s 2 net carbs per slice. And that was with rounding the eggs which were 1.92 carbs for 5 eggs up to a round number of 2. I get a total of 24 NET carbs and take 12 slices that is 2 net carbs per slice. I hope this helps as I know some people were asking. This is great info! Thank you so much, Becki! Hey there! I’m trying to go gluten free to see if it helps with some of my skin and stomach issues (this is about the 100th attempt to do so) but I am allergic to almonds so the almond flour wouldn’t work for me but I’m not allergic to any other nut so is there another nut-based flour that I can substitute or any other flour really? Hi Abigayle! Unfortunately, I don’t know of any flour that is a 1:1 replacement for almond flour. This is a little bit of a finicky recipe so it’s tough to make substitutions. Sorry! I love the sound and look of this recipe. I need a recipe like this for my son, with very low carbs, but he’s nut free. How can I alter the recipe or substitute for the almond flour, without compromising the carbs and stay gluten free? Hi Lorraine, unfortunately there is no easy sub for the almond flour in this recipe that doesn’t involve another nut flour. You’re not the first person to request a nut-free bread recipe, though, so it is on my radar and I hope to have something for you soon! Hi Nora, have you tried subbing the eggs for Chia seed and water? Do you think it’ll work? Thanks! Hi Jan, I haven’t tried it, but honestly I wouldn’t recommend it in this recipe since the eggs to so much of the work in creating the structure and texture. Sorry! I have a question – do you have to use a blender? Can I just use my stand mixer? Yes! Just make sure to mix as little as possible so you don’t get too much air. Too much air in the batter makes the bread rise too much and then collapse in the oven. Hi I.made the bread but I’m not sure what I did wrong. …it doesn’t taste good, it smells pretty awful also. I’m just not sure what I did wrong. I didn’t make any adjustments or subs to the recipe. Hi, I’m honestly not sure what went wrong. It may have been the quality of the eggs you used, since those have a huge role in the outcome of the bread. Did you use fresh, high quality eggs? That may be it. You may also just be more sensitive than most to the eggy taste and texture of low carb baked goods. Like many low carb breads, this recipe relies so heavily on eggs, that if you’re not the biggest fan of eggs it can be a turn off. I ALWAYS have this issue, but my breads always turn out awfully short, as if they are unable to rise enough to make a decent sized slice / reach an appropriate height. Do you have any advice on how to counteract that? Or am I doing something wrong? Should I use a shorter loaf pan (length wise)? Have yet to taste the bread itself though, but it looks great aside from the height! Hi! There are a lot of things that could be going on but the likely culprits are either your leavener (baking soda, in this case) or your oven temp. Those are easy fixes, luckily! Check the expiration date on your box of baking soda and unless it is a year from now or something waaaay in the future, just replace it (you can use the expired box for cleaning or deodorizing around the house). Also, your oven may run cool. Do you have an oven thermometer? They’re usually around $10 (or less) on Amazon and are absolutely indispensable, especially for older ovens. I use two! This is the one I really like, and it’s less than $6! Made this bread once and won’t be making it again. Much too wet and springy! Will not toast, no matter what. Any suggestions on how to make it toastable, would be appreciated. It sounds underbaked. Your oven may run a little cool. You may need to toast it for a very long time to effectively dry it out. Do you think it’s possible to sub the oil for coconut oil? I’m not a fan of canola oil. Thanks! I totally understand. I would recommend grapeseed oil, not coconut oil, if you’d like to sub in. Is the nutritional information per slice of bread? Per slice, but the loaf can be cut into more than 12 slices. Can the eggs be substituted? My hubby don’t eat the eggs. Hi Verushca, unfortunately, there is no easy replacement for the eggs in this bread. I’m so sorry! Hi Dawn. I can’t say with any certainty how it will turn out, since I’ve never tried either in this recipe. You can feel free to try (it won’t ruin the recipe, it just may come out differently)! Have you tried just egg whites? My husband is allergic to the yolks? Most recipes it makes no difference? Hi Mary! That’s an interesting question and to be honest I’m not sure how that would affect the nature of the bread. You may need to add 1-2 additional Tablespoons of oil to make up for the moisture/fat that is lost by eliminating the yolks. If you give it a try, I’d love to know how it works out. Good luck! I made French toast with it wow delicious! Oh great!! Did you end up using the yolks? Have you (or has anyone) tried adding yeast to this recipe to see if it gives a bit more rise? I’m thinking the natural sugar in the coconut flour may be able to feed the yeast. And/or maybe whipping the egg whites separately to soft peaks and then folding them into the batter at the end for more rise? I’m desperately searching for a normal sized sandwich bread for a Keto lifestyle. Thanks! Hi Tanya! I’ve never tried yeast in this, but you can feel free. There are some VERY heavy ingredients in this bread, so I am not sure how much additional rise you could get without using so much yeast that it would affect the taste (and possibly cause indigestion). You may have more luck whipping the egg whites, if you want to give that a try! I am trying hard to get us off grain, and sandwiches are so handy in our busy lives. I will be trying this, but wondered if you have added herbs or garlic for a savory bread? Also, does coconut oil work? Hi Jane! I have no tried adding herbs, but you could certainly try. Coconut oil is not ideal, but can be used in an emergency! The nutritional facts say per serving, is this per loaf, per slice? It is per slice, based on 12 slices per loaf. Just made it today. Overall, IT’S WONDERFUL. Thank you so much for this recipe! Aroma really eggy as it got closer to done, not a problem for me; taste of batter reminds me of southern cornbread and so does the taste of the finished bread. Has a truly golden crust. My loaf held together for slicing when cool, and in the hand in a test cheese sandwich. Mixed wet ingredients, using a 7-cup food processor, then added in the dry. The recipe (written for a major blender after all) was a tad over capacity but only a little leakage out the middle and after it was processed it thickened up; so, doable in a food processor. Texture was firm and uniform, like bread machine bread but a little less dense to the chew. As the loaf turned out it might be good for some smaller sandwiches, don’t know if I would be piling lettuce and small tomato slices on as toppings but I will make the experiment tomorrow. From your nutrition info for the whole loaf it has nearly same carbs as protein, 69g v 86g, and twice plus some as much fat, 204 g. So, low carb but not necessarily a bread for someone doing keto. Yeah, well, when I do a keto cycle I just pretend bread is fake food. This is great for days that are low carb.